If you want melt-in-your-mouth, succulent, juicy char siu pork, this is the only way to do it... in a pressure cooker. It will fall apart like pulled pork. 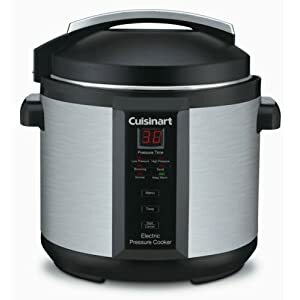 Order Pressure Cooker - This easy to use, ultra modern pressure cooker is not the pressure cooker that you mother or grandmother used. Cooks amazing meals, without the fear factor! Set pressure cooker to sauté. Add soy sauce, sherry, stock and half the char siu sauce in the bowl of a 6-litre pressure cooker. Cook for 5 minutes or until slightly thickened. Add pork. Cook for 30 minutes on medium, following manufacturer's instructions. Remove pork from pressure cooker. Cool. Reserve 1 cup cooking liquid. Cut pork into 18 even-sized pieces. Combine honey, sesame oil and remaining char siu in a bowl. Heat peanut oil in a large frying pan over medium-high heat. Add pork. Cook, brushing with char sui mixture, for 5 to 10 minutes, until brown and coated. Meanwhile, place reserved cooking liquid in a small saucepan over medium-high heat. Bring to the boil. Reduce heat to low. Simmer 3 minutes or until slightly thickened. Serve char siu pork with rice, Asian greens and sauce.